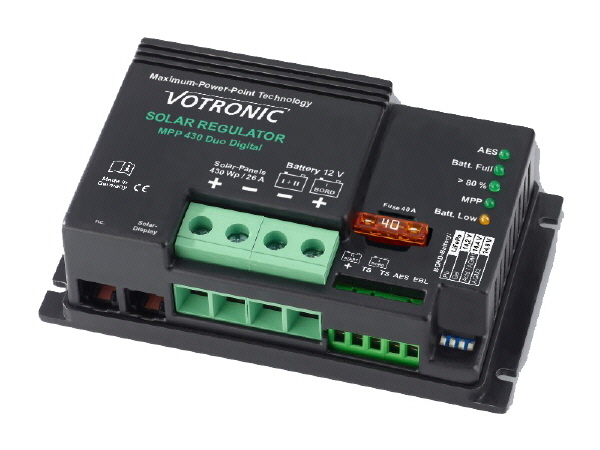 Controllers according to the MPP technology are continuously and automatically calculating the maximum power yield (MPP) of the solar modules several times per minute. The voltage surplus of the solar module will be transformed to a higher charging current for the battery (realised by high-frequency switching controller technology with high efficiency). This surplus of charging current ensures short charging times and the best possible power yield of the solar system. Indicators for operating state "Full", "> 80%", "Charging", "MPP" and "Low Voltage"